You see, the thing about doing a month of movies revolving around Netflix, is that sometimes they take movies off of Netflix that you blindly assumed you’d be able to watch in time for a Shocktober review. This happened to me last night when I sat down to watch 2004’s Open Water, only to discover that it’d been taken off of this almighty streaming service that we are at the mercy of. So in order to keep the continuity going, I was able to settle on a movie that pokes fun at horror movies (for the most part), and also happened to come out in the early ’00s. Now I’d be lying if I said I was expecting much from Scary Movie 3, but that made it all the more mildly pleasing that this movie isn’t absolutely terrible in the way that I was expecting it to be absolutely terrible. I could try to explain the plot of Scary Movie 3, but considering this is just a reference-fueled gagfest that basically just leans on other movie’s plots, I’ll put it this way: The movie starts out as The Ring, then it becomes Signs for a little bit, then it becomes 8 Mile, then it becomes The Ring again, then it becomes The Matrix Reloaded (for some reason), and then it becomes Signs again with a little bit of a generic alien invasion vibe thrown in. I’ll just admit that I haven’t seen any of the other Scary Movie’s, but I can’t imagine there’s much continuity going on here, other than the fact that Anna Faris and Regina Hall return as their characters from those movies. Because unlike the first two Scary Movie‘s, this was not a Wayans vehicle, and was instead helmed by David Zucker, who helped usher in the parody movie (for better or worse) with Airplane! 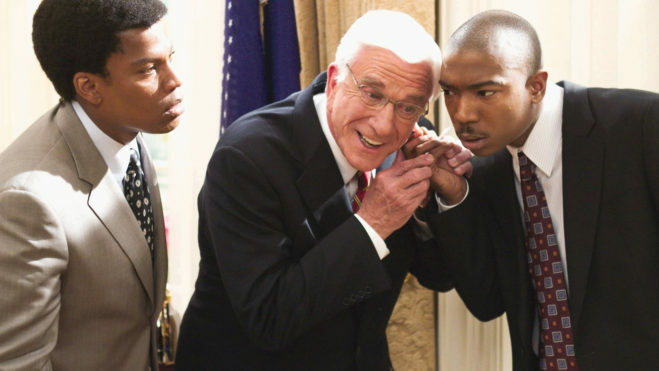 and The Naked Gun twenty years prior. And it definitely has that feel, as there’s just a plethora of gags, a lot of which aren’t great, but I’d say about 1 in 8 of them lands, which isn’t bad considering I thought this was going to have the .000 batting average of a Seltzer-Friedberg movie. And watching this movie, I kind of got the feeling that this is basically the best version of what a Seltzer and Friedberg movie could theoretically be. Because yes, a lot of the gags are juvenile and way too much of it relies on cheap-o slapstick, but at least they’re actually trying. At least there are actual staged comedic bits here with a set-up, punch-line, and payoff. I’m not saying they’re always good, but a lot of the time they’re at least solid. And despite the weird tonal shifts the movie makes, at least it stays fairly consistent with its main cast from beginning to end. Hmm… I feel like I’m giving this movie props just because it actually feels like a movie. Scary Movie 3 was also somewhat enjoyable in a way that I’ve been suspicious that these ’00s parody movies might be, which their creators probably hadn’t anticipated. And that’s that watching Scary Movie 3 felt like a punch to the face of early ’00s nostalgia. This movie has references both to that “And twins!” beer commercial as well as “can you hear me now?” guy, which I guess is somewhat relevant now, weirdly enough. Hell, this movie features both Fat Joe and Ja Rule in extended cameos, while Simon Cowell makes an appearance as himself before being gunned down by the fake cast of 8 Mile. So even though Scary Movie 3 is probably partially to blame for carrying on the idea that it’s ok to make a movie that’s just an extended string of pop culture references, it’s not so bad. I do have to say, unlike the one Seltzer-Friedberg movie I’ve seen (Epic Movie), it didn’t feel like it was 100-years long despite having a running time of around 70-minutes. No, Scary Movie 3 zips by at a tight 84 minutes, and because its plot is compact enough and the gags are unembarrassing enough, watching this film is a pretty painless experience. Because as we all know, there’s nothing scarier than a supremely unfunny comedy. Good call, going with the Russian version of the poster. Это единственный плакат высокого разрешения я мог бы найти!